Governor Brown addresses students from North Medford High School. 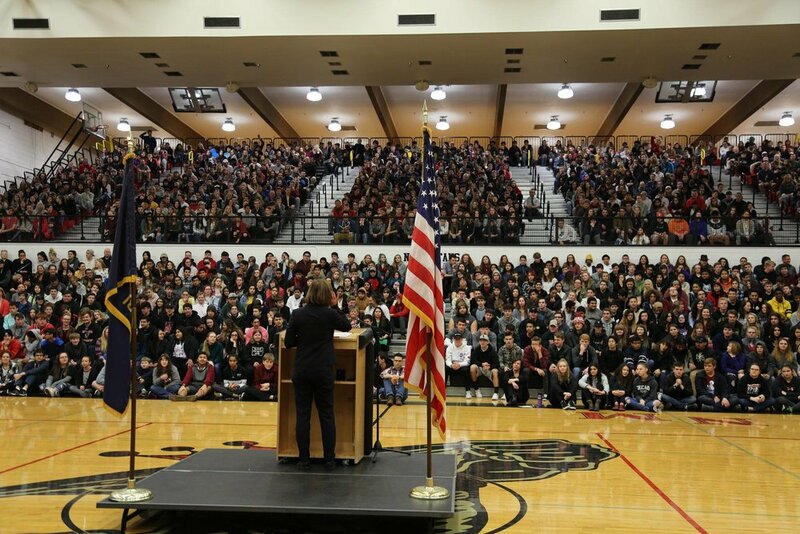 (Salem, OR) — High schoolers from across Oregon made a cheering commitment to graduate from high school in recent weeks during Governor Kate Brown’s sneak preview of her 2018 State of the State address. The formal address will be delivered in a joint session of the state legislature this coming Monday. During events at Churchill High School, Bend Senior High School, and North Medford High School, Governor Brown called on students for their help to raise Oregon’s graduation rates, which recently reached 77 percent, a marked bump for the state but still among the lowest in the nation. She cited the effectiveness of hands-on learning, like Career and Technical Education, on raising graduation rates, and committed to expanding hands-on learning programs throughout the state. "Hands-on learning makes school relevant, it connects career to the classroom and it awakens all of you to the power of your own potential,” said Governor Brown. "I know we have much more work to do, but I'm going to fight to make sure every student in every community across Oregon has access to hands-on learning." In question-and-answer sessions following the remarks, students brought up topics that ranged from climate change to homelessness to immigration. Afterward, Brown spent time in design, robotics, engineering, medical training, and auto body repair classrooms talking to students about their experiences in their career and technical education programs, and to teachers about the needs for their programs and professional development. The formal State of the State address will take place in the House Chamber of the State Capitol on Februrary 5. In the address, Governor Brown will announce her 2018 agenda at the kickoff of the Joint Session of the Seventy-ninth Legislative Assembly. Press release and images from Oregon Governor Kate Brown.